Before leaving Canada, I had a solid grasp on Canadian English. I knew there were differences between British and American English, and my language differed from both of these. Beyond that, I didn’t give Canadian English much thought. After finishing my BA, I ventured to Germany to teach in sleepy Uelzen, a village known for its train station. As my fellow teachers and I slipped into speaking a mix of English and German, I didn’t take notice of the variations in our speech. Only when my students questioned me about my mix of British and American English did I wonder about the identity of the language I spoke. My year in Germany was followed by two years in Belgium, where my feeble understanding of Flemish didn’t get me very far. When I moved to London, I was thrilled by the prospect of living without planning out my speech in advance. Transitioning to British English was easy. I learned new words for vegetables and picked up a few turns of phrase. I began to appreciate the gentle smoothness of the “s” in contrast to the jarring, angular “z.” At work, my clients had simple style guides with straightforward spelling conventions. Headings tended towards sentence case. I emerged unscathed from my internal work communications, unlike a dear colleague who sent out a management memo about an event happening “in loo” of a meeting. And then. After a recent return to Canada, I found my own language no longer made sense. I struggled to come to terms with the mix of “flavour” and “recognize.” More shocking was the tendency to use exclamation marks and capital letters everywhere. Titles and subheadings shouted at me. My reaction was due in part to growing comfortable with a more consistent form of English, but also to the fact that times have changed. Communication has become faster-paced and less formal, with thousands of emails and texts fired off every minute. There are no borders for online communications, which further blurs the lines between different language styles. My reintroduction to Canadian English has reignited my appreciation for our unique country with its influences from our British heritage and our American neighbours. Rather than battling against our sometimes nonsensical language, I have embraced it. I delight in explaining Canadian spelling to my British husband and discussing how we measure people in inches and distances in kilometres. I’ve learned to see Canadian English less through a comparison to British or American English and more as what it is on its own. I appreciate its leniency and what it reflects about us as a country of many cultures and influences. In private company, I still use my favourite British words. “Aubergine” is much better suited to the regal vegetable than “eggplant.” The punchy “rubbish” echoes the nature of what it articulates better than its blander companion “garbage.” While its rules and tendencies are not always easy to explain, ours is a special language and I’m happy to use it. 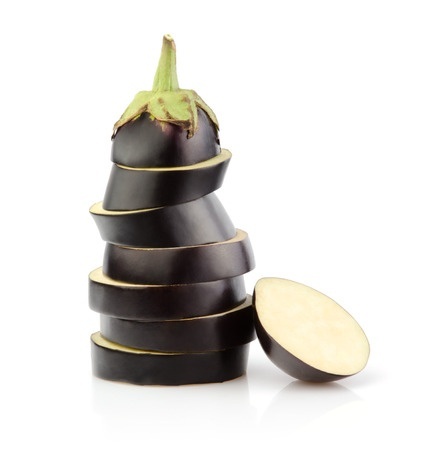 12 Responses to "Eggplants and Aubergines"
Great post, thanks. Having spent several childhood years in school in England, and having attended high school and university in the States (where we called it “college”), I’ve now lived in Canada for the past thirty-some years. I too have come to adopt and relish Canada’s peculiar mix of Bristish and US spellings and terminology. The only Canadianism that I still find impossible is the insistence on using capital letters in apparently random and seemingly incorrect ways. Can anyone explain it to me? Is there a peculiarly Canadian rule about this? Thank you for your comments, Marnie! I know that Editing Canadian English starts off its section on capitalization by commenting that “capitals are confusing”. It goes on to explain that “the proper use of capitalization is a balancing act: accuracy on the one hand; reader respect and consideration on the other”. I know this doesn’t give you a hard and fast Canadian rule, but I feel like it suggests that there are many differences of opinion. A beautiful post. Canada has come of age by having its own culture, political system, foreign policy and version of English. Thank you very much, Wilf. I do have to catch myself sometimes and remember that we’re still a youthful (nearly) 150 years old. Thanks for a great post, Marianne. Years ago I worked with a client who was studying Ukrainian folk dance in Canada because it was so well preserved in its original forms, when compared to folk dance in Ukraine itself. I often wonder if this also applies to Canadian English (and Canadian French). Many of our habits (excessive capitalization, for example) seem to be left over a bygone era. Perhaps in the colonies we have a tendency to hold on to some conventions that the mother language was able to let go. I notice the uppercase style also persists in the writing of business writers who learned their English elsewhere in the Commonwealth. Virginia, this is such an interesting point. In my hometown of Antigonish, Nova Scotia, there’s a very strong Scottish culture and the town holds an annual Highland Games. It also features Gaelic on street signs alongside the English. I found it interesting when the signs were first introduced, as no one ever refers to streets by their Gaelic names, and I doubt a letter posted to a Gaelic address would reach the recipient. I feel like the idea of the signs first stemmed from a very strong desire to preserve the culture. Thanks for the food for thought! Marianne, thank you for the interesting and, from my perspective, timely post. I recently edited a mining guidance document using British style. The -ise endings seemed pretty straightforward until I got to “organize/organise.” This had me flummoxed as a result of conflicting advice from various sources until I found the answer I needed in Editing Canadian English (“organize,” if anyone is interested). Thank you, Margaret. I remember “organize/organise” creeping into British texts I worked with, and I also came across differing views of what was correct. It’s nice to have a clear answer for next time. I found this post very interesting since I used to live in the northwest of the US and now live in Britain. I always wondered how Canadian English compared to both. It’s also interesting what Virginia mentioned about traditions that have continued away from their original influence. My British husband always found it quaint that in the US there are traffic signs that say Yield (instead of Give Way) – that sounded very old-fashioned to him. Thanks for the interesting example, Valerie. I have the opposite reaction to “Yield” vs. “Give Way”. I hope you’ve had a smooth transition to British English. I can identify with this too, Marianne. As a Brit coming to Canada via the US, I was surprised how many pitfalls there were. What did “taking a rain cheque mean?” and how do you spell “cheque”? Is it “In light of….” or “In the light of…”? And why, a Canadian friend asked, did the Scottish bed and breakfast proprietor not understand when she said she didn’t think a cot would be big enough for her? Language evolves, but as you rightly point out there are cultural reasons for the distinctions. Each Canadian turn of phrase evokes a unique cultural history. Thanks for the post! These are great questions, Alison! Thanks for reading. I’m so curious to see what our language looks like ten years from now.